Elastoplast Silver Healing Fabric Strips kill harmful germs for optimal healing. They have a long lasting antiseptic effect which reduces the risk of infection. 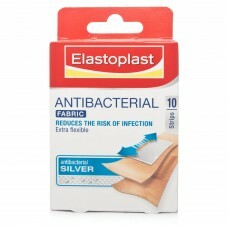 Elastoplast Silver Healing Fabric Strips with antiseptic silver, helps to kill germs instantly and for up to 24 hours. Silver has been used for centuries to kill germs. The ancient Greeks and Romans used it to make water safe to drink and heal wounds. The silver in the Elastoplast Sensitive Silver Healing Fabric Strips is contained in a clever polyethylene net that stops the wound pad from sticking to the wound and the silvers antiseptic powers are released the moment it comes into contact with it. And as silver is such a powerful antiseptic, theres no need to use a separate antiseptic cream. Elastoplast Sensitive Silver Healing Fabric Strips is skin friendly and suitable for children (big and small). Silver is non-toxic and very rarely irritates the skin- helping to promote the healing process. Cuts & Grazes: If a cut or graze is deep or severe, it's important to see your GP or visit your local A&E department. For more minor cuts and grazes there's a lot you can do to help stop infection and speed up the healing process. The basics come first. Make sure you wash your hands well before applying any plasters or dressings. Better still, add a few pairs of disposable surgical gloves to your first aid kit - wearing them really cuts the risk of infection. Clean the wound carefully under cold running water, wiping away any dirt and grit. If anything is embedded under the skin, leave it alone, then visit your GP or local A&E If nothing is embedded apply pressure until the bleeding stops Dry the skin around the wound carefully Cover and protect with an Elastoplast plaster.